During the years he searched for the Tomb of King Tutankhamun, Howard Carter lived in a modest adobe house a few kilometres from his work site. The house is still there, as if waiting for Carter to resume his work. When we first visited Luxor in December 2006 we glimpsed the house from the road as we drove past on the way to The Valley of the Kings. 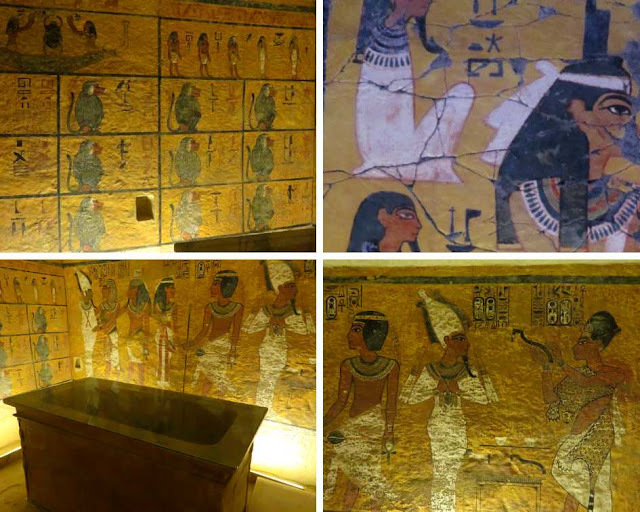 It wasn't open to the public then but in recent years it has been restored, and on our most recent visit in December 2018 we were able to see both the house and a replica of the burial chamber of King Tutankhamun's Tomb tucked away at the back down a garden path. If you have the time, Howard Carter House is well worth stopping at, if only to give you an idea of how the man who made one of the greatest archaeological discoveries of modern times lived. Referred to by our driver, and everyone else we spoke to, simply as 'The Carter House', Howard Carter House stands on a hill overlooking Kings Valley Rd leading to the Valley of the Kings (where Tutankhamun's Tomb was discovered). With its domed, mud-brick construction and white-washed walls the house is simple and unpretentious, very much what you might expect of the living quarters of a man so relentlessly dedicated to his search. Inside it appears unchanged since Carter lived there in the early 20th century right down to the ancient icebox in the corner of the kitchen. Although the house is small enough to wander through in 15 minutes, there are enough newspaper cuttings, photographs and other snippets of information decorating the walls to keep you there for hours if you let them. 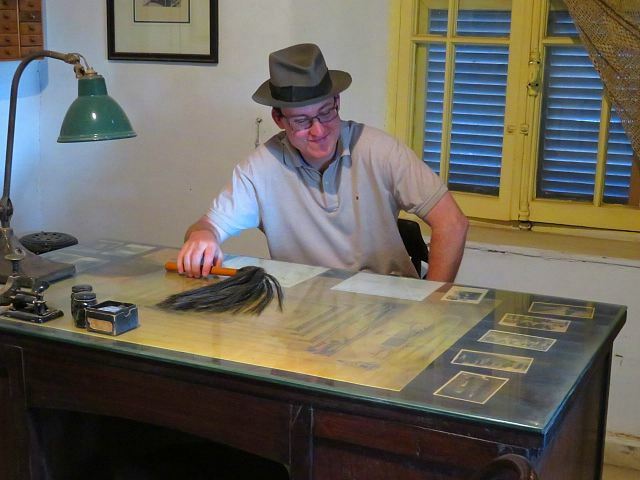 A highlight is Carter's study where visitors are encouraged to don a hat from the period and take their place behind the desk for a quick photo op. Andrew, our son, - as a young Howard Carter. 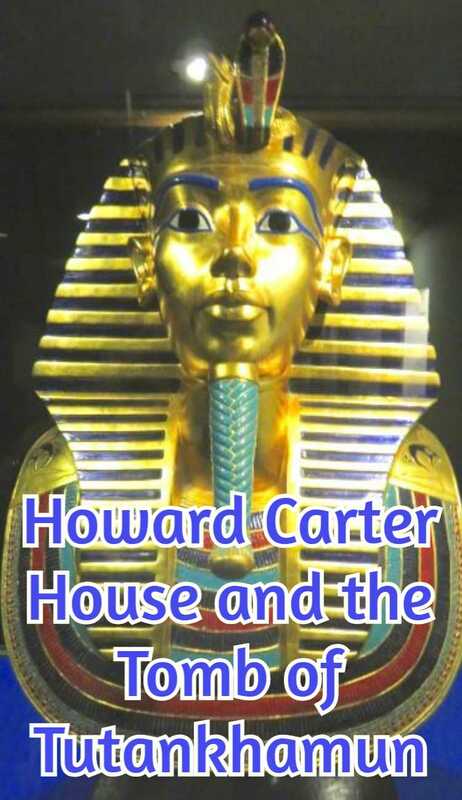 Where is Howard Carter House? 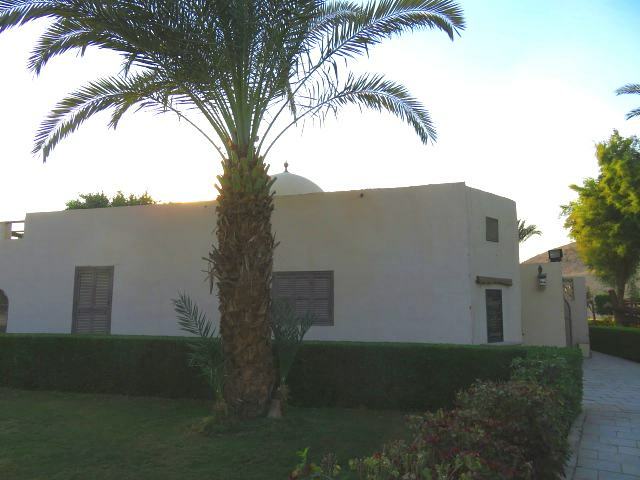 The house is on the corner of Aswan Western Agricultural Rd (the main road from Luxor) and Kings Valley Rd. Look to your left as you come back down the hill from The Valley of the Kings and you can't miss it. Buy your tickets at the Valley of the Nobles ticket office about 3 kms before you get to Howard Carter House, just after the Colossi of Memnon. Ask for the 'Carter House', misspelled on the ticket information board as 'Cartar's House'. Howard Carter (1874 - 1939) was a young man of only 17 when he first worked in Egypt. Employed as an artist to copy decorations from the walls of tombs he soon showed an aptitude for archaeology. In 1907 he was hired by Lord Carnarvon, a British peer and keen amateur Egyptologist, to supervise the excavation of nobles' tombs at Deir el-Bahri on the west bank of the Nile near Luxor. When, in 1914, Carnarvon obtained the concession to dig in The Valley of the Kings he appointed Carter to supervise the work. At the time the name 'Tutankhamun' was that of an obscure pharaoh who very few people had heard of. Carter however believed Tutankhamun was buried in The Valley of the Kings and after a long interruption during WWI he began his search for the boy king. Years of unrewarded labour followed until by 1922 Carnarvon had despaired of the search. Carter persuaded him to grant one last season of funding. On 1 November 1922 Carter turned his attention to a line of huts he had abandoned a few seasons earlier. 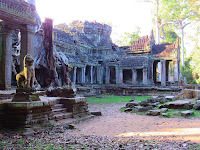 On 4 November a water boy tripped on a stone step until then hidden by the huts. The step turned out to be the top of a set of stairs leading down to the entrance to Tutankhamun's Tomb. When Carnarvon arrived two and a half weeks later Carter chiseled a small opening in the sealed doorway and using the light of a candle was able to see into the tomb's antechamber. He famously described what he saw as 'wonderful things'. At the back of the antechamber between two statutes was a further doorway. When it was opened on 16 February 1923 it revealed Tutankhamun's burial chamber where the young pharaoh's mummy lay undisturbed in a coffin of solid gold. Replica of Tutankhamun's Tomb - The doorway between the two statutes leads to the burial chamber. I doubt you can visit The Valley of the Kings without exploring Tutankhamun's Tomb - I couldn't, either on my first or second visit, and the second time I knew what to expect. But be prepared to be underwhelmed. The tomb is one of the smallest and least ornate in the valley. With the exception of a stone sarcophagus which once enclosed Tutankhamun's coffin, the tomb is eerily empty, most of the treasures having long ago been transferred to the Egyptian Museum in Cairo. (See my post on exploring Cairo for information on the museum). No photographs are allowed inside the tomb and in a bid to preserve the floor a false wooden platform and railing has been built from which to view the sarcophagus and burial chamber decorations. All in all my advice is - don't expect too much. 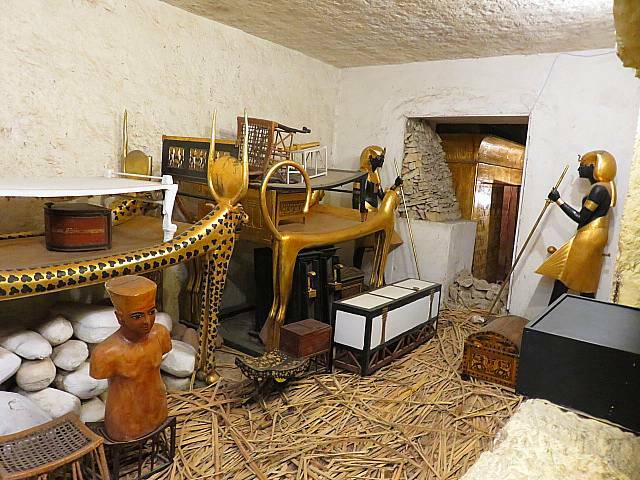 At Howard Carter House you can explore an exact replica of Tutankhamun's burial chamber. Sadly the tomb's ante-chamber with its collection of treasures has not been reproduced. However as a place to grab a few photos and study the wall frescoes, the replica chamber is better than the real thing. The replica of Tutankhamun's Tomb at Howard Carter House. Tutankhamun was born about 1342 B.C and became Pharaoh when he was nine years old. He is thought to have been the son of Akhenaten and was married to Akhenaton's daughter, probably Tutankhamun's half sister. Tutankhamun died without children when he was about 18 years old. Although his tomb is one of the smallest in the Valley of the Kings the fact that its treasures were largely intact when it was discovered catapulted him to posthumous fame. Interesting fact: Tutankhamun almost certainly did not look like his famous golden death mask. It is likely the mask was created for someone else entirely, possibly a woman, and used for the boy king when he died prematurely. Do you think the face looks like that of a woman? Note: This is a photograph of a replica. Tourists are not permitted to photograph the real thing. The short answer is - nobody knows! In 2005 a CT scan of Tutankhamun's Mummy showed his leg had been broken shortly before he died leading to speculation that he may have died in a chariot accident. Other theories include - murder (of course - what mystery would be complete without a possible murder - also there is a hole in the back of his skull), malaria or a genetic disease (it is likely Tutankhamun's parents were brother and sister). Whatever the cause the popular image of Tutankhamun as a virile, handsome young king cut down in his prime may be wildly inaccurate. One theory suggests Tutankhamun was born with a club foot and may have been unable to stand unaided. 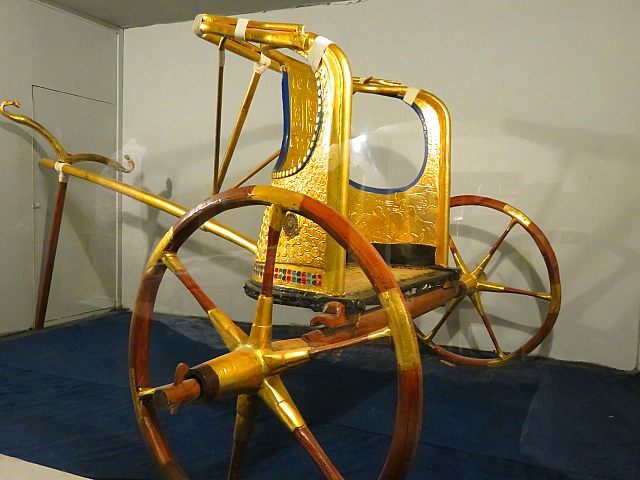 A copy of one of the chariots found in Tutankhamun's Tomb. Did the boy king die in a chariot accident? What was found in Tutankhamun's Tomb and where are the contents now? The 'wonderful things' which Howard Carter described were all removed long ago. Most are now in the Egyptian Museum in Cairo. (See my post on exploring Cairo for information on the museum). The only remaining 'treasure' is Tutankhamun's stone sarcophagus. Now empty it once held three layers of coffins the innermost of which was made of solid gold. Although there was some evidence that grave robbers had disturbed the tomb long ago, when Carter opened it the tomb was crammed full of chariots, furniture, statuary, clothes, jewellery, musical instruments, ornaments, vases, jars, perfume, lamps and countless other items, many of which were made of gold or silver and encrusted with precious jewels. 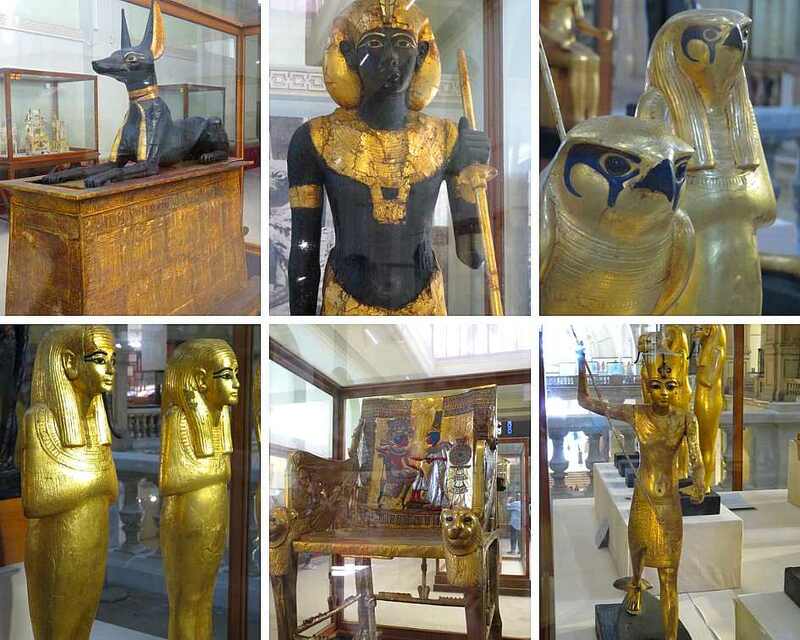 A few of Tutankhamun's Treasures on display at the Egyptian Museum in Cairo. Was there a curse on the Tomb of Tutankhamun? Lord Carnarvon died within two month's of the opening of the tomb and just five months from when its entrance was found. There was much speculation in the press he had fallen foul of an ancient mummy's curse although there is absolutely no evidence he died of anything other than blood poisoning from an infected mosquito bite. Several other people who were present at the opening of the tomb, burial chamber or Tutankhamun's sarcophagus as well as a radiologist who x-rayed the king's mummy died within a few years. Most deaths had natural explanations except for the radiologist who is said to have died from a mysterious illness. Howard Carter who you would expect to be the main target of any curse lived for another decade and a half. For tours to the Valley of the Kings click - here - or any of the links below. Note: If you book a tour by following my links I will earn a small commission. The price for you will be the same as it would be if you don't follow the link. The 9 & 1/2 best places to visit in Cairo - and one to avoid! 11 things to do in Alexandria. What do you mean you left your passport on the plane! How to Visit the Valley of the Kings: What you need to know in 2019! If you would like to follow our travels, enter your email address in the 'Never miss a post: Follow by email' box in the right hand sidebar just below our profile picture. If you found this post interesting, fun or useful please share it with friends, family or the world! OMG, this is so interesting! It's the first time I have heard about this house, I had no idea. The tomb of Tutankhamun is just one of those things that you'd need to see once in your lifetime, isn't it? Great photos, thank you for this story! The tomb itself is very plain but the feeling of standing inside something which was lost for so long and was such a significant discovery is amazing. I will definitely go to the Carter house when I visit the Valley of the Kings. Thanks for the recommendation. The replica of Tutankhamun's tomb is very interesting. Before we went I thought the replica would be a bit of a dud but it is worth seeing if only because you are allowed to take photos there. I didn't know that Howard Carter's house was open to the public! Thanks for the tip, and for mentioning that there's a reproduction of Tutankhamun's burial chamber there as well. I'd love to visit the house, and also to see the Egyptian Museum in Cairo. The house wasn't open to the public last time we were in Egypt in 2006 and David, in particular, was disappointed not to be able to see inside it so it was great this time that it was open. What a fascinating place Lyn, when you think of the history there. David has a history degree and I married one so we both love anything with a bit of history. Egypt is one of those place which is absolutely worth a second visit and a third and ........ .
How incredibly interesting. When I was a young girl I went through a phase of obsession about archaeology and told everyone that was what I was going to do with my life. Of course, that didn't happen but I still have that interest. I'd love a visit here. Andrew, our son, was mad on Egyptology when he was little. I always thought he would be an archaeologist but he took a different different direction - as you do. It was great to be able to take him to Egypt and it was loads of fun travelling with him. Egypt was so interesting. I would go back there again in a flash. Love the Young Howard Carter - My understanding of the curse is it's a bacteria on the paint on the walls. You're told not to touch it because it transfers through the skin. That was an article I read awhile back, so I may be mixing up facts but if you googled, you'd find it. I recall reading that while Howard Cater had no time for any talk of curses he was very conscious of the dangers of ancient bacteria. What a really interesting post - and so much historical insight. I'd love to visit The Carter House'. I'd also read about the curse and wondered if it was true or just heresay. I like Lydia's explanation above that it could be bacteria on the paint on the walls - but who knows? The 4,000 year old air in the tombs might also have something to do with it - lol! Our tour of Luxor was a day-trip and rushed so didn't even notice a house. We did love the artifacts (and our ability to get up close to them) in the Cairo museum. Great post! One day you will have to go back to Luxor and spend more than a day. It has so much to offer. What an amazing attraction. 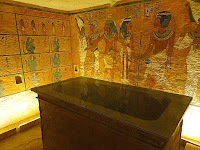 We have been enamored with the whole King Tut experience, so this would be a perfect visit for us. Thanks for sharing! 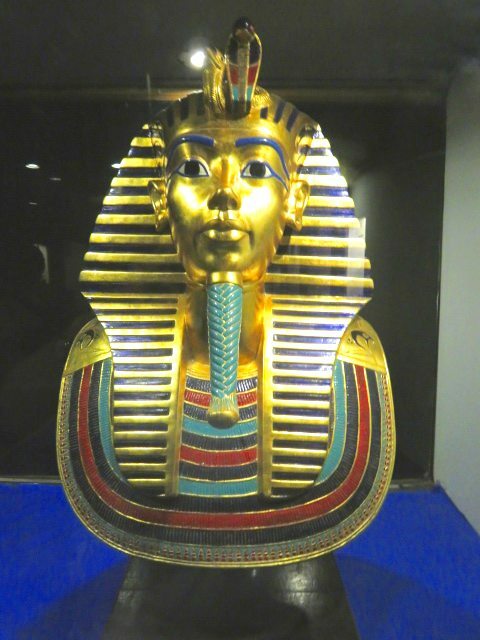 If you have an interest in Tutankhamun you should visit Cairo and go to the Egyptian Museum where you can see the treasures found in his tomb. They are fascinating. As fans of Egyptology, this is right up our alley! Looking forward to learning more about the man and the work in the Valley of the Kings. Thanks for sharing! Like you I am a fan of Egyptology. It is such interesting stuff and you have to admire Howard Carter. He never gave up on his goal.